I have not been able to write final comments, but will soon. Ray has written some things that I would encourage everyone to read. Check out Ray’s page. Not only is he an animal on the bicycle, he has a really big heart. Today was a day of withdrawal. Due to traffic problems, Mary Ann and Gail did not arrive until well after midnight last night. It is really good to have them here. We would never have done this without their total support. Their support has been nothing short of spectacular and it is good for them to be here at the finish. Ray and I both stayed up for them, some 6 hours past what has been our regular bedtime. Even with that change, I went to breakfast at a little after 6:00 and sure enough, Ray and Gail walked in to greet me. While we need a big rest, it felt a little weird today for us not to ride. 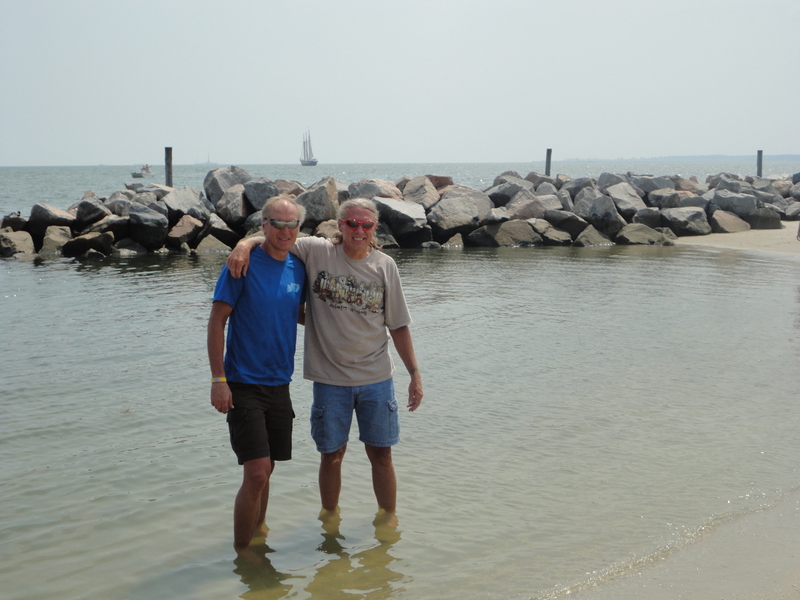 We were going to drive over to Virginia Beach for a photo-op, but since the official end of the TransAmerica is the harbor at Yorktown, we decided to go back down the waterfront at Yorktown to dip our toes into the water there. Our reasons were two-fold. One, as mentioned, was that this is the official ending spot. The other, however, was that Carlie and Becky, our two young co-adventurers we met on the side of a mountain in Utah, were going to be cruising into the finish line this morning. 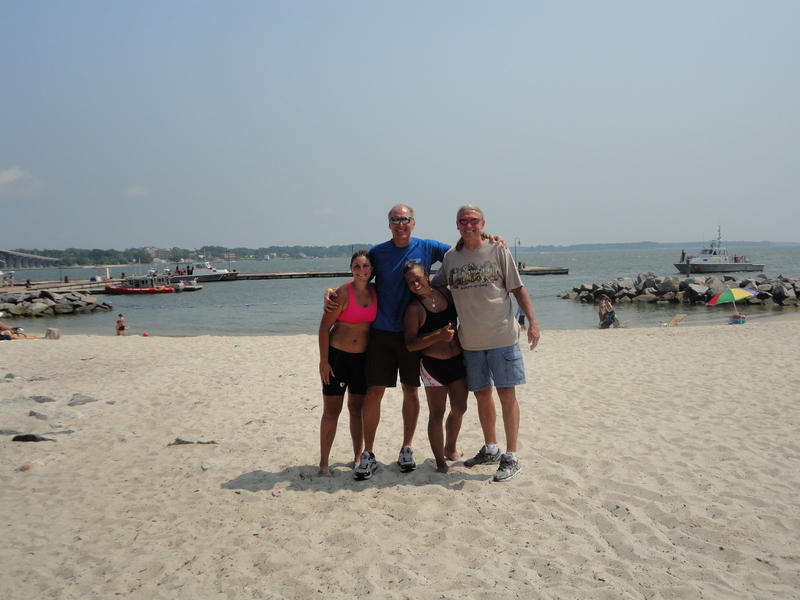 These two have become a big part of our trip as we have shared a lot of the triumphs and tribulations with them. They have really been disciplined and tough. Their enthusiasm has helped us make it to the finish line ourselves. And, my guess is that they will be a part of our extended family for years to come. They are the best! 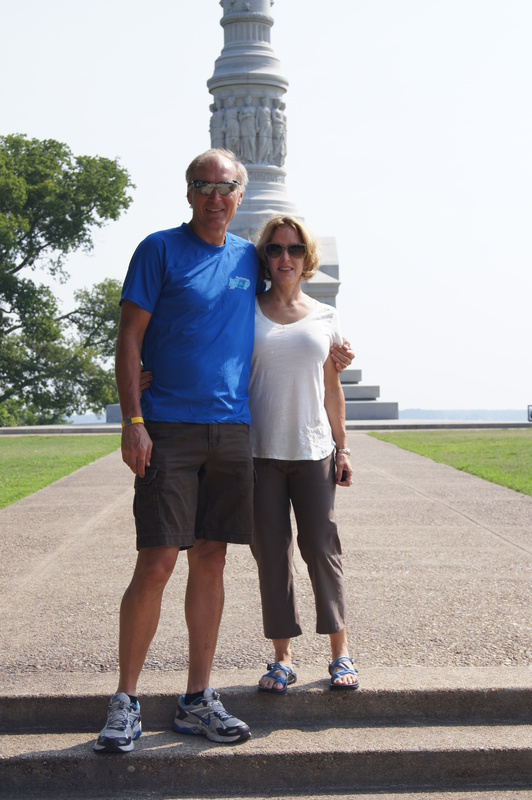 So, we all took a really interesting tour of old Yorktown and waited for the girls to arrive. When they did, the first thing they did was run to the beach and jump into the water. Carlie said, because it was salt water, it was like jumping into a sweatbath, but no matter, it is a sweet finish to an amazing adventure. We were all really proud of them. The only thing missing for us was Phil, Dave, Pete and Gary, whom we first met as we headed up to Carson Pass on the first few days of our trip. As I have stated before, there is a certain connection that you get with someone when you are on a quest like this. I cannot speak for them and they may disavow any knowledge of us. However, I can speak for Ray and I. We have a tremendous amount of respect for them, not just for what they have done, but for the kind of people they are. We are headed home now, but the only regret I have is not being able to hug those guys when they get to Yorktown. I hope that our paths will cross again. My life is better, having met them and spent time with them. I have a lot to process. I will probably make another post or two. There are a lot of people I would like to thank and a lot of thoughts about this experience. I will try to get those together. Some people have mentioned a book. I don’t know if that will ever happen. But, in the book of my life, every person who has encouraged us on this journey has their own special page. And for that, I cannot thank you enough. If you have made comments, emailed or in any other way helped us, I will get in touch with you, I promise. And just so you know, we do have another adventure up our sleeve. We ain’t dead yet! Keep in touch…. Today’s ride got off to a great start. 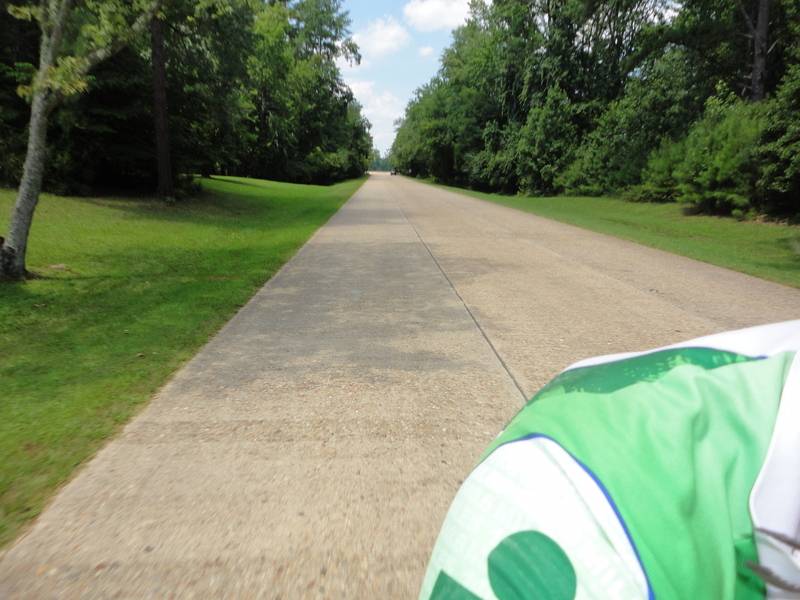 I mentioned yesterday that we (or I should say “I”) decided to try an interstate ride. Today was nothing like that. 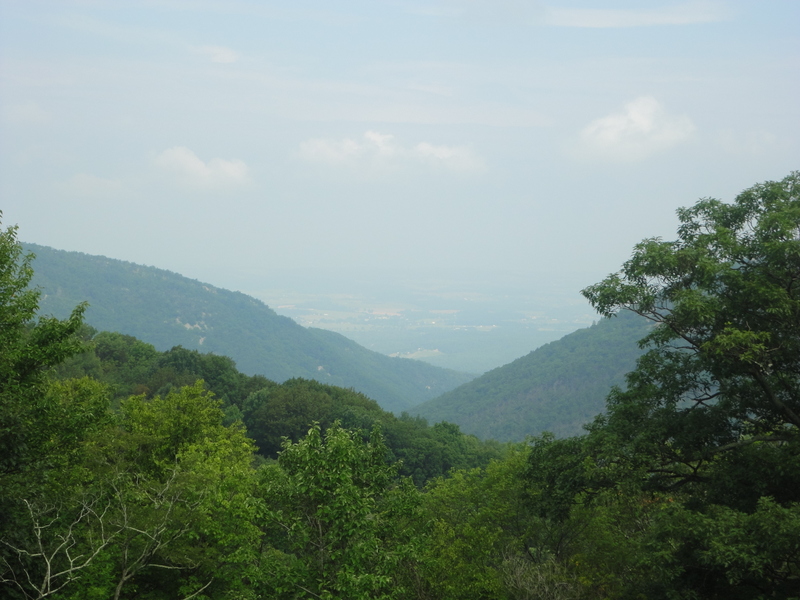 We got off to a little earlier start due to the excessive heat and long distance in the hills of the Shenandoah Valley. Our motel was a little off the mapped course, so we worked our way back to the course and enjoyed a flying downhill ride for the first mile. Life was good. Then we got to the bottom of the hill and it just didn’t feel right so I stopped Ray. After a 5 minute team meeting, we realized we were right on course. However, we were going toward San Francisco. Not a good thing, So we had to climb back up the hill we just rode to get back to mile 0. Not the best of starts, but we finally got it straight. Within 5 minutes, we were in the country again. It was a very warm but another beautiful morning for us to enjoy. 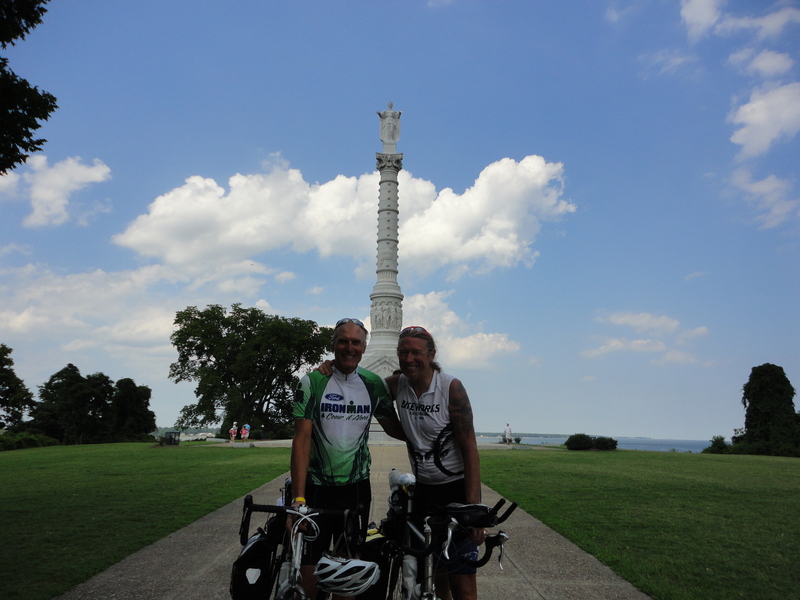 We are both totally worn out, so the going was slow and we settled into a pace that both could handle and just enjoyed the ride, knowing we would eventually roll into Lexington, our goal, some 90 miles away. Sunday morning traffic was super light which made for a comfortable ride. We ran into a lot of cyclists. However, none of them were touring. They were all roadies. We figured that we were on one of the popular local courses. While we did not stop to talk, it was still good to see them all. We had no services for the first 28 miles or so of our ride, but we did stop at the village of Catawba, just to rest for bit. While there, a lady drove up to ask directions and we made a new friend. Miki is a really nice person who was searching for the location of the wedding of a friend. We were able to help her because we had just been on the road she needed. She was very encouraging to us about our ride. She is a professor at Vassar College. 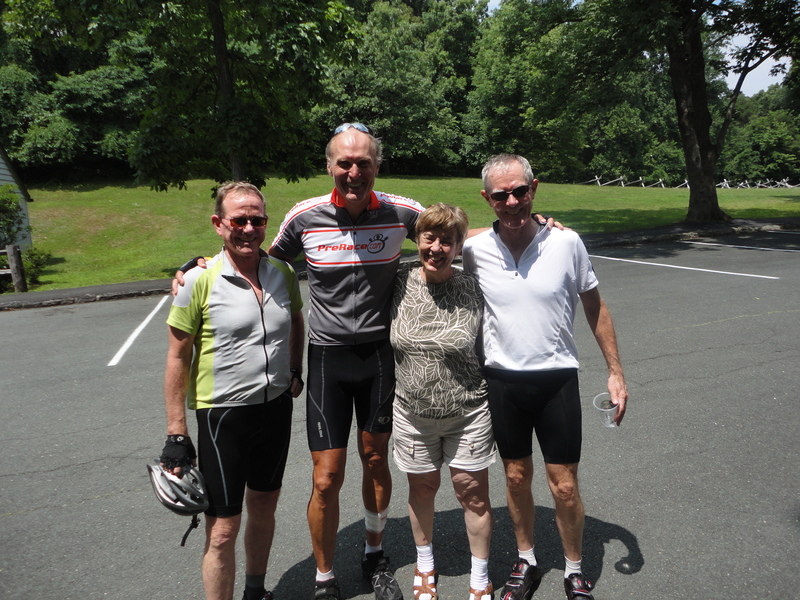 What are the odds of meeting a Vassar College Professor on the back roads of Virginia on a Sunday morning while riding bikes? Great fun. We rode on, eventually making it on to the village of Buchanan. Along the way we ran into several old farms that had signs that read like a history book; Circa 1778, Circa 1802, Circa 1848. It is amazing to see all of the history. One particularly beautiful home was Circa 1806 and it was right beside the interstate. I couldn’t understand that, with all the land available to them in 1806, why would they build right by the interstate? Go figure. 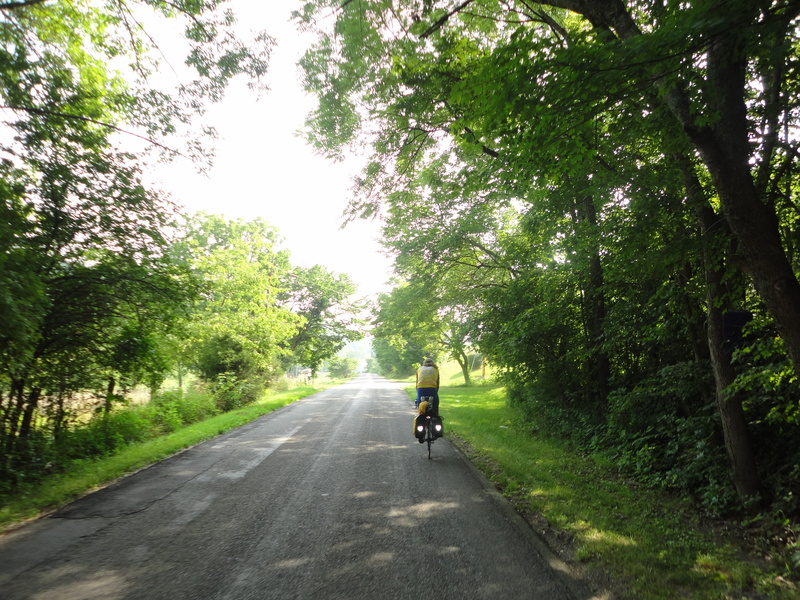 The weather was heating up, clouds were building toward afternoon thunderstorms and we were dead tired, but we kept turning the pedals over. Soon, we were cruising into the town of Lexington. 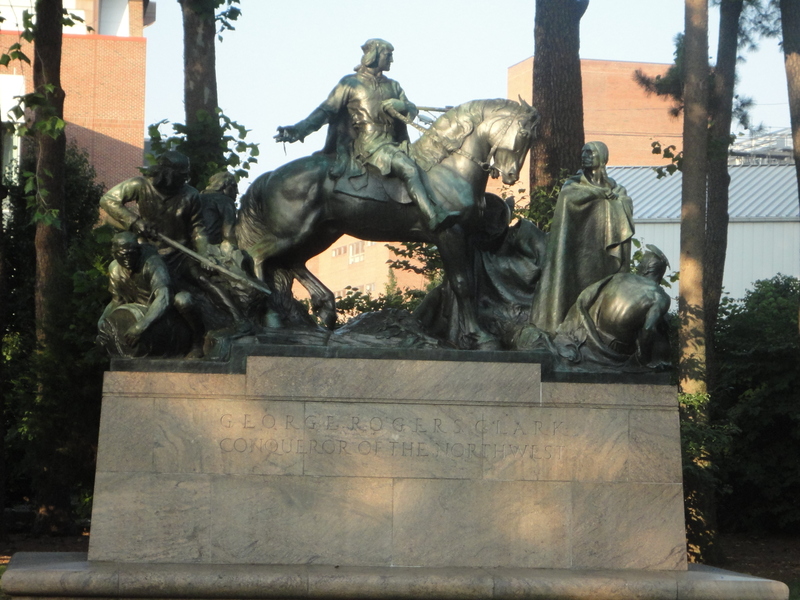 Lexington is a lovely, historic town and home to Washington and Lee University and VMI. Really a treat to see all the history there. It looks like a town to make a note for a re-visit and spend some more time there. We made the long day. By taking a few chances and getting a bit off the map, we saved a couple of miles and ended up with 90 miles for the day. 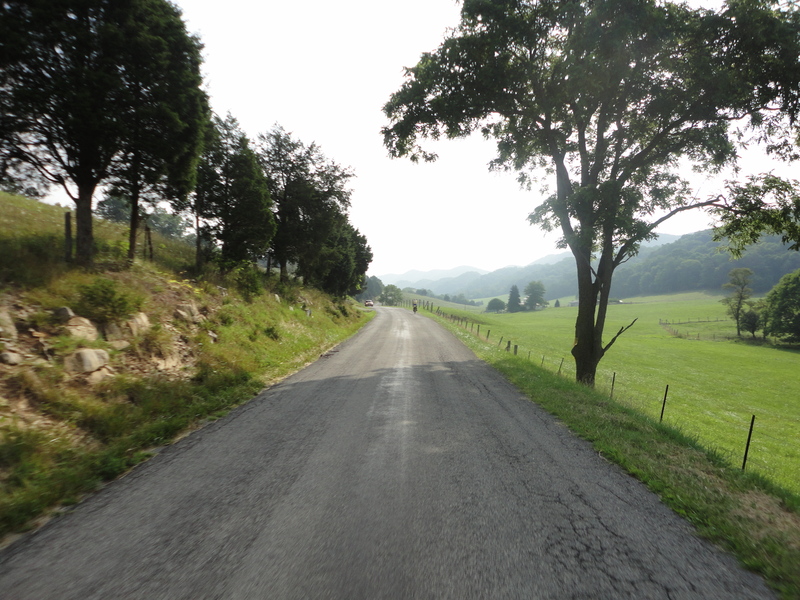 Tomorrow, we try to squeeze out one more huge climb up and over the Blue Ridge mountains. After that, we should be able to start thinking about…the next day. One day at a time. We are still in good spirits. Wish us luck tomorrow! The Virginia countryside is really amazing. 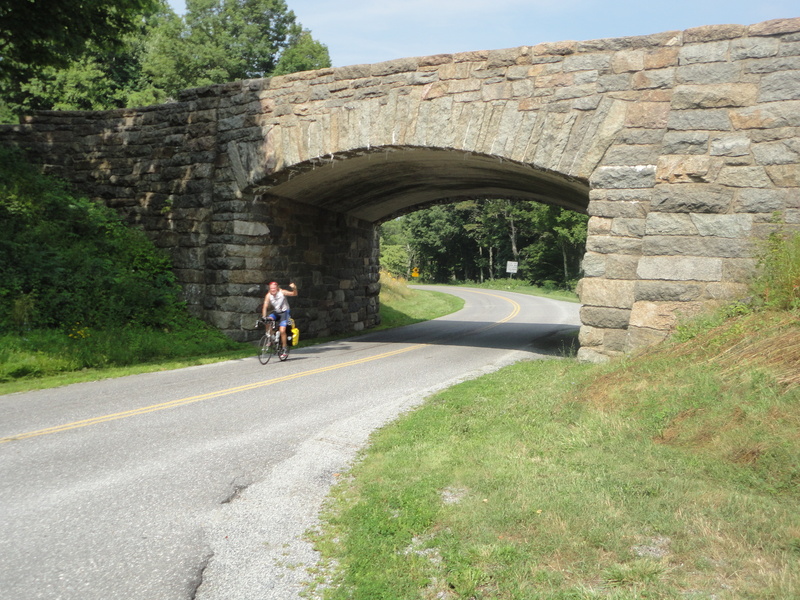 This part of our ride is more like a history tour than a bicycle tour. Every town and village has reminders of a very active past. This holds true from the tiniest villages that have been long since been slowly suffocated by the nearby interstate to the larger cities that have survived and thrived. Only on a bicycle will you see a lot of this history. As I mentioned yesterday, it is humbling to see where so many others have lived their lives, some to a historic end that we may all know, but many others just living their lives. All of it makes you just that much more curious to know more. I have learned that someone could spend their entire life simply travelling and learning just small parts of the rich history of this country. Enough commentary on life, I will move on to today’s ride. We kept the adage intact that “there are no easy rides.” Tomorrow’s ride we figure to be close to 100 miles. 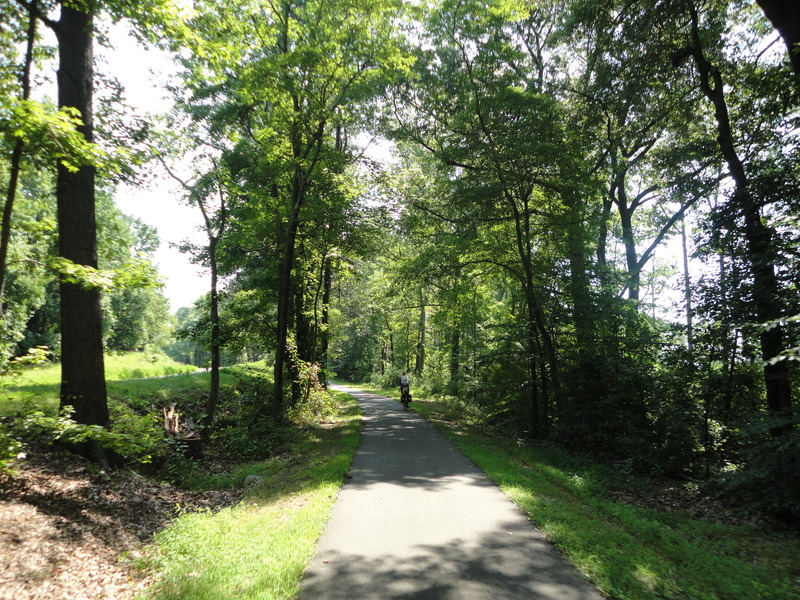 Then on Monday we cross the Blue Ridge with a massive climb. I am thinking the Trek electric-assist bicycle would be a great option for me at this point. But alas, pedaling is still the only option we have. With two hard days coming up, we had hoped that today was going to be an “easy” ride of 55 miles or so. It was a beautiful ride, it was a fun ride, but it was not an easy ride! Looks like we are going to finish this adventure with none of those. I am not complaining, but it is one of the lessons we have learned on this trip. Riding day after day, not knowing the terrain, and carrying everything you need with you on the bike requires a much different mindset that preparing for the group ride on a weekend. I think we have made the adjustment pretty well, but it has been an adjustment. 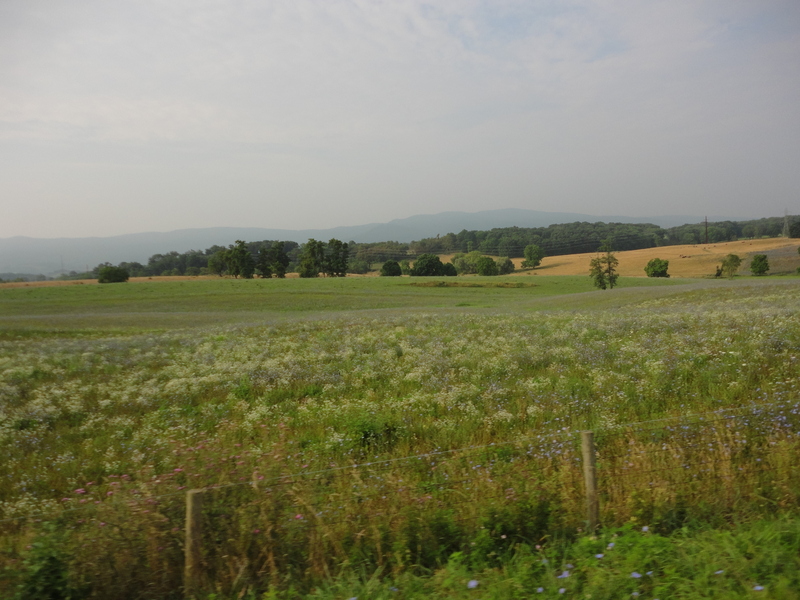 Today was filled with rolling hills in the beautiful Western Virginia countryside. There was enough climbing to challenge our tired legs. We have gotten to the point where sometimes we simply say, “That hurts”. That is all the energy we can muster. The other guy usually just grunts agreement. However, we made some great memories. 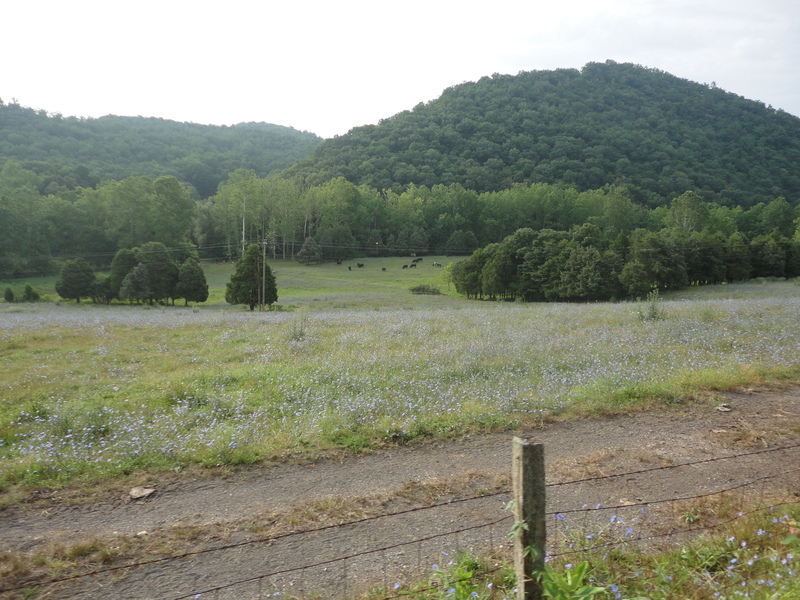 One was riding on a road that was filled with wildflowers on both sides and two mountain ranges in the distance. 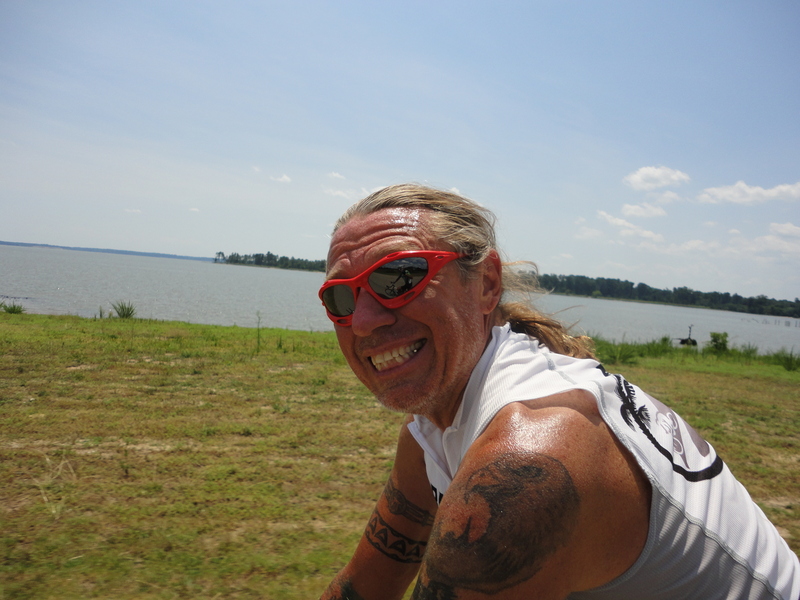 The other was riding for 3-4 miles right beside the New River into Radford, VA. And yet another was the Number 1 combo at Arby’s when we pedaled into Radford. Thunderstorms were building as we cruised into Christiansburg, so we were anxious to find our motel. It was a little off route, so we had a little trouble finding it. You might say a lot of trouble since I caught myself riding down the entrance ramp into an interstate. I turned to tell Ray we had made a mistake, but he was at the top of the ramp. He is a little smarter than me. We made it to our destination, a ride of 56 miles in dry weather. We had time to do laundry today. We needed that. Buzzards were starting to point us out to each other and dive-bombing our bags. The next two days will be a challenge, but then it’s all downhill to the beach! Thanks to all of you who are reading and commenting. We hope to be able to thank you individually in person or via email when this is all done. Your support has made a fun adventure a great adventure! We woke up in a fog this morning. I know, I know, most of our friends would say that we wake up in a fog every morning! But we were in a fog in two ways. First, the cumulative fatigue had made us both a bit weary, so getting going was a little tough. Outside, there was a real fog. It was thick and a bit worrisome for us as we contemplated our day. On the one hand, a fog meant that the heat might be held in check. 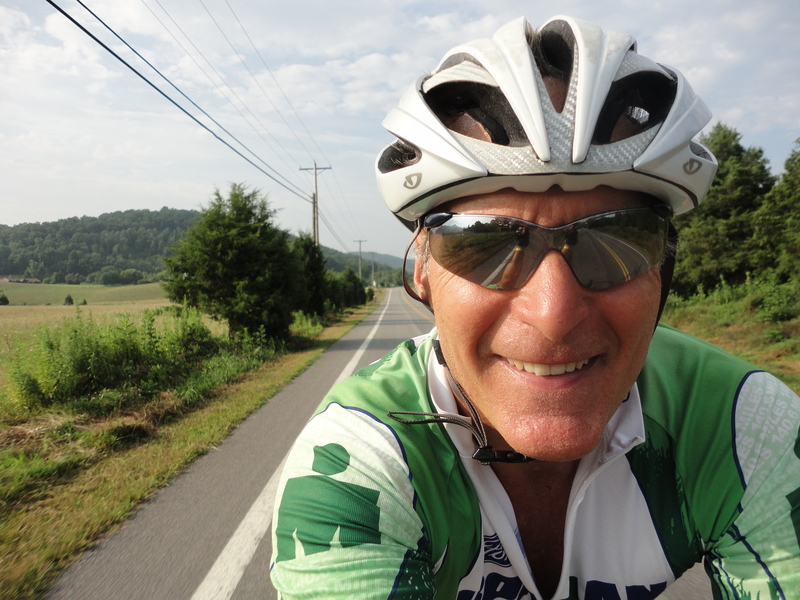 With heat warnings out over most of the eastern U.S. the thought of riding 70 miles in the mountains was troubling. Remember, I am Mr. Daunted. 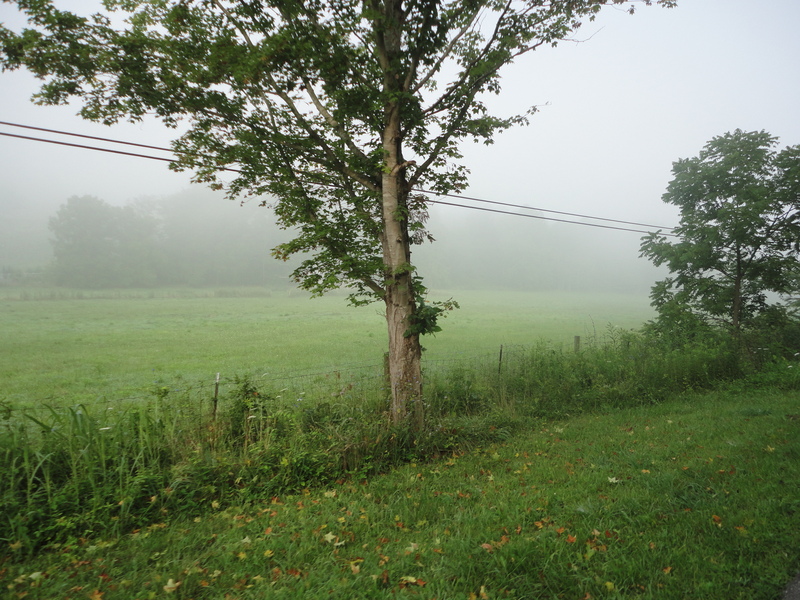 So, from that standpoint, we welcomed the fog. But the lack of visibility was scary. We were not concerned that we couldn’t see, but concerned that someone couldn’t see us. 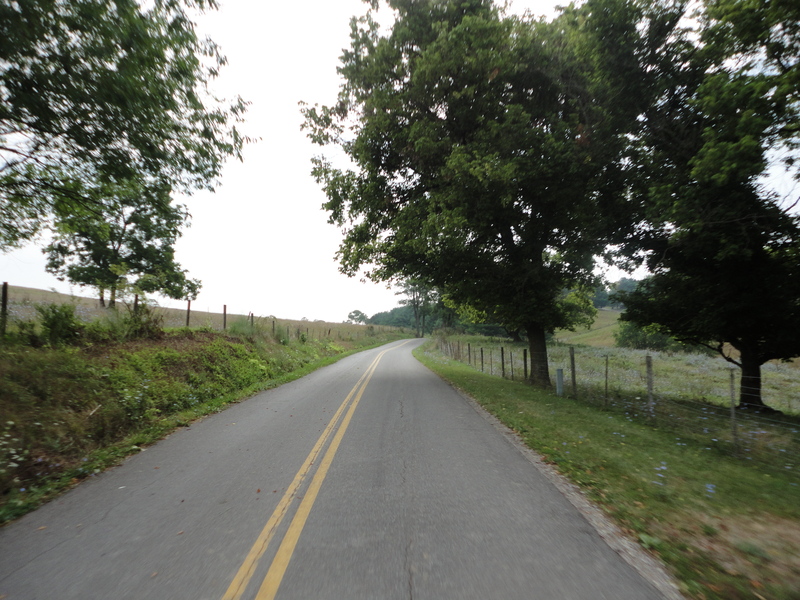 Luckily, the route we were riding started on a four-lane road, but turned off onto a country lane after only 2 miles. We have ridden on so many country lanes on this trip that you would think that it might get a little old. However, it seems like every road has its own personality and its own beauty, so it never gets old. Today was special because, as we were riding down this back-road, we saw several historical markers. Though none of them would have much significance to a large majority of people, it makes you think about all the history an area holds. Many of these markers date back to the time of the American Revolution. It is very interesting to think of all the people who have come before us and to see the same land they walked, and in some cases, the homes in which they lived. The fog was lifted by the time we got to Meadowview. 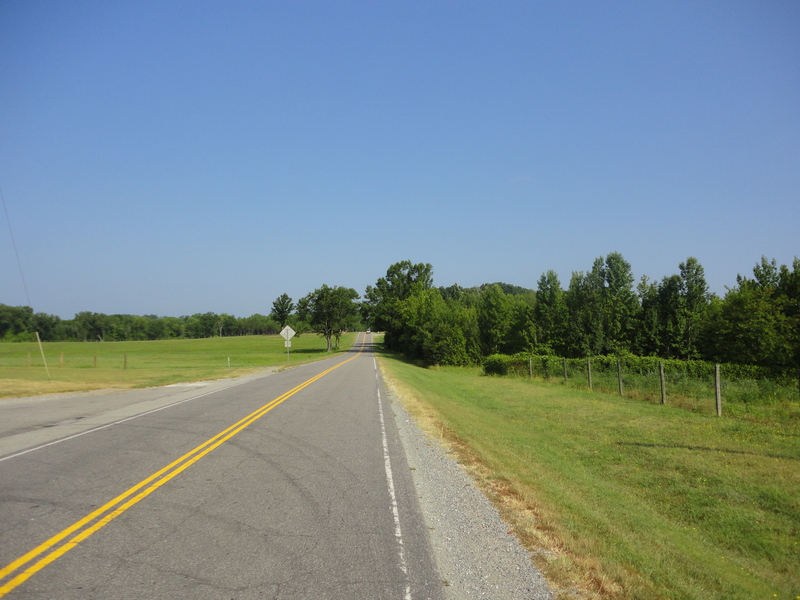 We got on a road that paralleled Interstate 81 for the last 45 miles or so of our ride. Though traffic was a bit hectic, long lines of visibility made things seem a little safer. We stopped in the town of Marion for a snack a little before noon. Then we hit the road again just as a thunderstorm hit. But it was just a baby and we rode out of it after about 3 miles, then about 3 miles later, we ran into another one, this one complete with lightning. It was a big dog. And you know me and dogs. We decided to sit this one out, found a store and had more health food. Most of you now know what that means…something that is 100% processed and has sugar in it. We sat and watched the storm pass over. When the thunderstorm passed, the result was that the oppressive heat we had feared was held at bay. Therefore, our last 18 miles into Wytheville over rolling hills ended up being pretty easy and pretty fast. We cruised though downtown Wytheville, which is just another beautiful little hometown, and found a motel the has actually been updated in the past 40 years so we are back in the lap of luxury in Wytheville, VA.
73 miles for the day. Back on track to make it to the coast by next Thursday or Friday.I apologize for our lack of pictures, but internet access here makes it almost impossible to upload. We are glad the real fog lifted and we think the personal fogs that we were in yesterday have lifted some. We both felt better at the end of the ride today than we did at the beginning. Total mileage, 3,285 so we think around 500 miles left to go! This is fun. Dr. Ray and Captain Alpo woke this morning in an indecisive mood. We weren’t sure how my leg would be. We kept the wrap on it from last night since it was difficult to get the bleeding stopped yesterday, despite the best efforts of Dr. Ray. However, my biggest problem was not the leg, but the complete fatigue from 2 consecutive days of nearly 100 miles a day in mountains and heat. We had a few options. One was to take a full rest day at the Breaks. 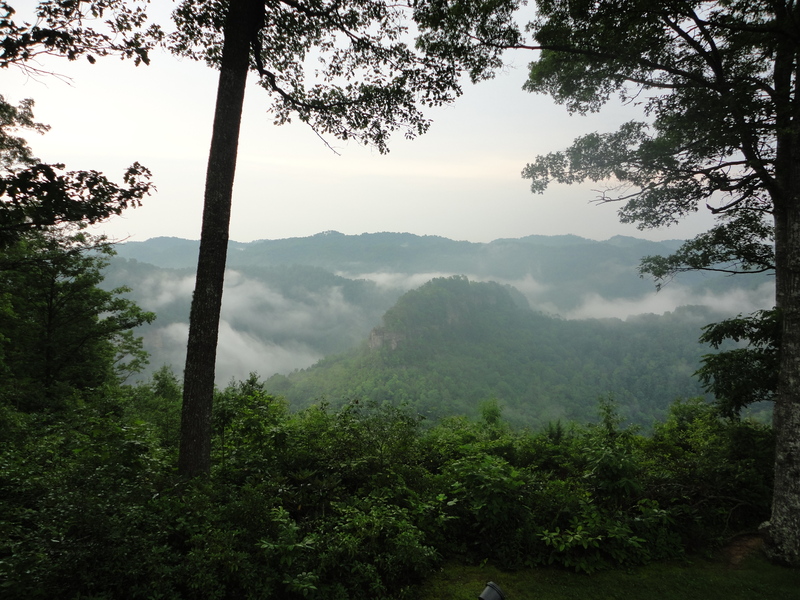 Breaks is an interstate park right on the Kentucky/Virginia border. And, like state parks in Tennessee, it is very nice and would be a great place to take a rest day. However, we hate to burn a day with the Blue Ridge mountains staring at us. So we split the difference. We decided to ride about 40 miles today and see if we could make some progress, but allow time for some rest. The ride was great for the first 1.57 miles! We started at the top of a mountain and right from the start we were coasting. But what we have learned is not, “What goes up must come down”, but rather, “What goes down must go up twice as far”. At least that seems to be the truism of this trip. While the route was short today, it did not lack climbing. We remembered a really tough climb out of Berea called Big Hill. We were not encouraged when we saw the map today and saw that one of our climbs was up Big Mountain. But, the morning clouds kept the temperature manageable and we were able to make decent time and enjoy our first full day in Virginia. 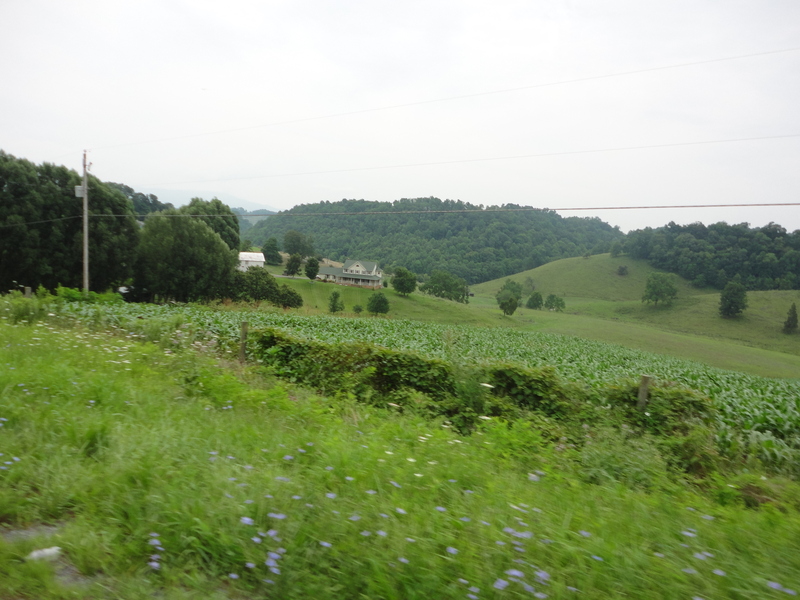 During the first part of our ride, the countryside was very much like the area of Eastern Kentucky that we just left. The hills were steep, wooded and very tight. In other words, there were not expanding vistas and broad valleys. It is a very rough landscape with not a lot of land available for development, whether on a large-scale with a town, or for individuals trying to carve out a home place. This type of environment also makes the going tough for us and the traffic. 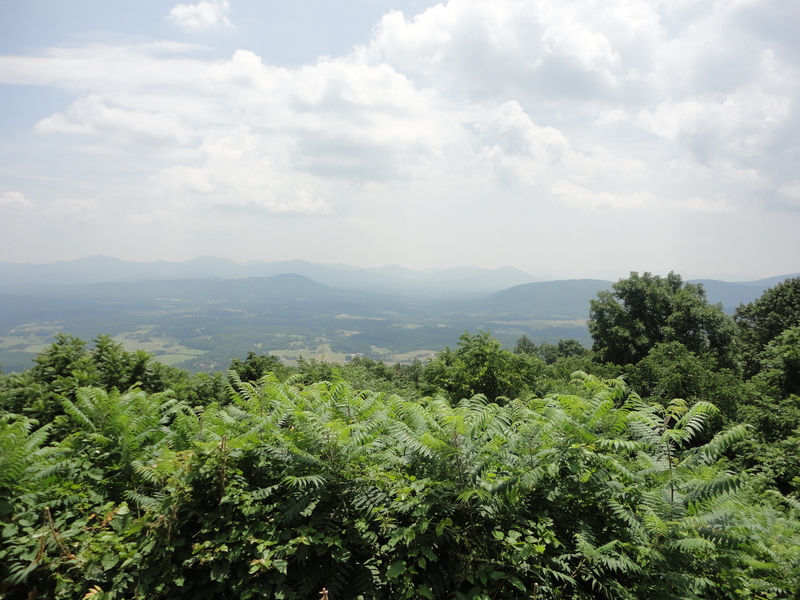 Then all of a sudden, beginning at the top of Big Mountain, a switch seemed to be flipped yet again and the Blue Ridge mountains could be seen in the distance. There were wide valleys and gorgeous long-range views. We flew down into the town of Honnaker, VA, then took a break before climbing the last little bit into the town of Rosedale. Here, we are in a motel museum. It is a motel that appears to have been built in the 1950’s and has not been touched since. We found out after we checked in that it is listed as closed on our maps. It certainly would not do for most normal people. But Carson, the old fella who runs it is a really sweet soul. Just talking with him is a treat. Meeting him will make up for the lack of luxury and is another brick in the great memory wall we are building. We are altering our original plan just a bit by staying here without adding a day. We still have that day in our back pocket in case we need it. We hope to make it the Wytheville tomorrow and will be right back on schedule if we can do that. It is hard to believe that we have only 7 rides before we hit the Atlantic. If all goes well, we will get there next Thursday. However, we have to focus on today, so right now, I am going to rest, consult with Dr. Ray, and get ready to rock on tomorrow!